One of the many performances from the Eau Claire Jazz Festival's 52nd Street showcase. Alright everybody, it’s almost time to get those fedoras and vests looking spiffy for a night out on the town. The 48th annual Eau Claire Jazz Festival is gearing up for a springtime weekend of concerts, competitions, and more, all taking place around the UW-Eau Claire campus and surrounding area. 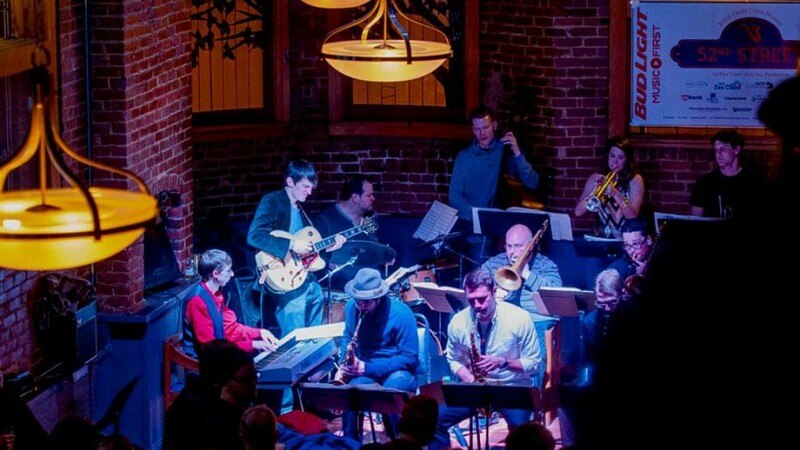 The festival is primed to kick off April 16 at the State Theatre with Shaun Johnson’s Big Band Experience, an energetic, eight-piece band that aims to blend a contemporary big band sound with a shiny, pop-infused flair. Tickets are $25 and $15 for students. Incoming guest artists and headliners for the rest of the festival include a critically acclaimed vocal group, New York Voices, at the State Theatre on April 17. The quartet brings a collection of past favorites from Paul Simon to Frank Sinatra, along with newer pieces by the likes of Annie Lennox and their own compositions. They are known for their close-knit voicing, exciting arrangements, and unparalleled vocal blend. Featured trumpeter Terell Stafford and pianist Nachito Herrera headline on April 18 at the Memorial High School Auditorium, backed by UW-Eau Claire’s own Jazz 1 ensemble under the direction of Robert Baca. Also preforming are the winners of the day’s competition. New York-based Stafford, a classically trained musician deemed “one of the great trumpet players of our time” by legendary pianist McCoy Tyner, is an incredibly versatile player combining an appreciation for melody and his own brand of lyricism. Herrera, also classically trained, has been described by the Minneapolis Star Tribune as “rhythmically intense. Romantic. Dynamic. And jaw-droppingly good.” Prior to playing the festival, Herrera toured Cuba as part of a good-will musical mission. Tickets for the Friday and Saturday shows are $20 for adults and $10 for students, but get them quick, because last year’s concert was sold out. Like most of us, you’ve probably had the desire to time travel at least once or twice. If so, you’re in luck because now there’s a chance to experience a small slice of 1930s and ’40s New York with the festival’s fourth annual “52nd Street.” From 4pm April 17 to 2 o’clock the next morning, 12 Barstow Street venues will host a variety of talented local and regional musicians performing swing, ragtime, R&B, soul, blues, acoustic, and big band music. Some venues are all ages while others are for the 21-plus crowd, so be sure to plan accordingly! All-access wristbands will be sold at the doors of each venue; they are $5 and get you into every venue all night long. The festival is also jam-packed with a full schedule of public educational opportunities and master clinics by guest artists and festival adjudicators. Over 100 regional middle, high school, and college bands will participate in the festival in both competitive and non-competitive categories.